Dad and I focused on replacing a section of decking on the roof that I had mostly stepped through the weekend I purchased the house. Dad was headed home around 3, so we were trying to get things done efficiently that day. This turned out to be a rather fast repair. Roofing and roof patching is a lot easier than I imagined. We started by finding the perimeter of the area that we wanted to focus on. After finding those shingles that we were going to take out, we delicately lifted up the nails of the shingles directly above them and overlapping them from the sides. 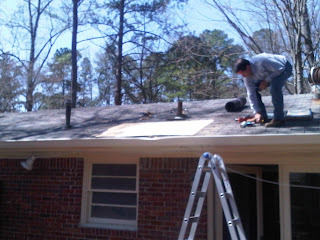 I am postponing the full re-roofing until May-June because we may need to change the location of the plumbing vents. If we move those, we are going to have to install new decking and drill new holes for the locations. After we had all of the shingles off the roof within the perimeter, we inspected the decking section of where I stepped through. I did not have a camera on me at this point so, once again, I missed out on a few important shots for this post. The secondary bathroom vent flashing had leaked in the past and it ran down the truss under the decking. This led to rot in the decking near the soffit. Dad used the circular saw to cut the decking out. We measured out a 48"x48" piece and made sure one edge was a seam to the truss. We then cut out some 2x4s to attach to the trusses so that we had somewhere to nail the new decking to. Unfortunately, being a home built in the 70s (they sure were cheap back then), all of the decking on the home is 1/2" plywood. Fortunately, I still had enough plywood left over from repairing the rotted corner that I could use on the roof. I have a feeling that there will be a few more sheets of plywood going onto the roof to replace decking damage when we re-roof the house (mainly where it has bowed a fair amount; using 3/4" decking will help to avoid this if you build a house anytime soon). This comes to a total of about $55. Several of these items will be re-utilized on the re-roofing project. No more roof leaking or rot damage to the truss or ceiling! Your new roof shingles look really good! We never tried doing house repairs on our own because I only have four young daughters with me at home. We have to hire a roofing service do these kinds of things for us. I think they’ve done a good job at it because our ceiling hasn’t leaked for some time. Missie, we are going to hire out the whole roof project. It is in need of replacing, and we just don't have the manpower to do all that by ourselves! I think you guys did pretty well in changing your roof shingles. I hope that your new roof project will turn out great. Make sure that you hire a team of reliable contractors for that. 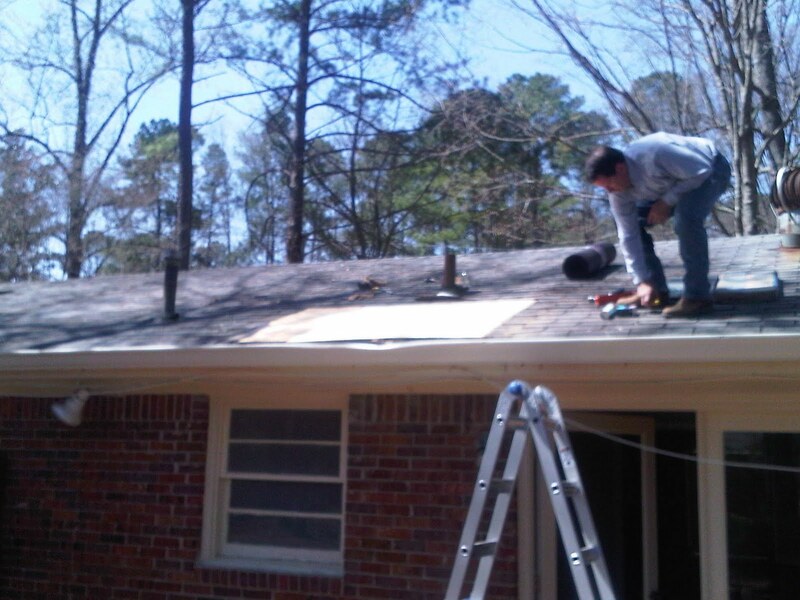 This is pretty cool for first-timers fixing your own roof. I hope that the roofing contractors you will hire for your new roofing project are reliable and will give you good quality service. Oh wow, it's quite interesting to know that you can place a new roof over an existing one. That's something new that I have yet to hear about. Maybe it would be something for me to talk to my uncle about, just to see if he'll like the idea.. I think you might have misunderstood; we didn't put a new roof over the existing one. After this temporary patch, we had the roof completely replaced. They removed the shingles and I forget now but I think they replaced the decking with 3/4".